At Loma Linda Academy, we understand that finances play a role in your child’s education. Tuition is an investment in your child’s future, so we assist many families who demonstrate a financial need. Let’s work together to find a solution for your child’s education. If you are new to Loma Linda Academy, we invite you to a private Educational Success Consultation with our principal. We focus on your financial goals and the academic future of your child. Both parents are encouraged to attend the consultation. Please call 909-796-0161 to schedule a consultation. We are partnering with Smart Aid, an independent third-party company, to process your financial aid application. You will be directed to their website to create an account that can be used for several years. Part of the application process involves submitting copies of your 2018 tax returns and Forms W-2. Other documents may also be requested. You will have the ability to submit those documents (if you have scanned them) with your application. If you are unable to scan the documents, you will be able to fax them or mail them in. Both of those options will extend the time needed to review your application. At the end of the application process, you will need to pay a $30 fee to Smart Aid. Until the fee is paid, your application cannot be submitted for review by Smart Aid. Once the application and all required documents has been submitted to Smart Aid, they will conduct a review and inform Loma Linda Academy of your financial need. 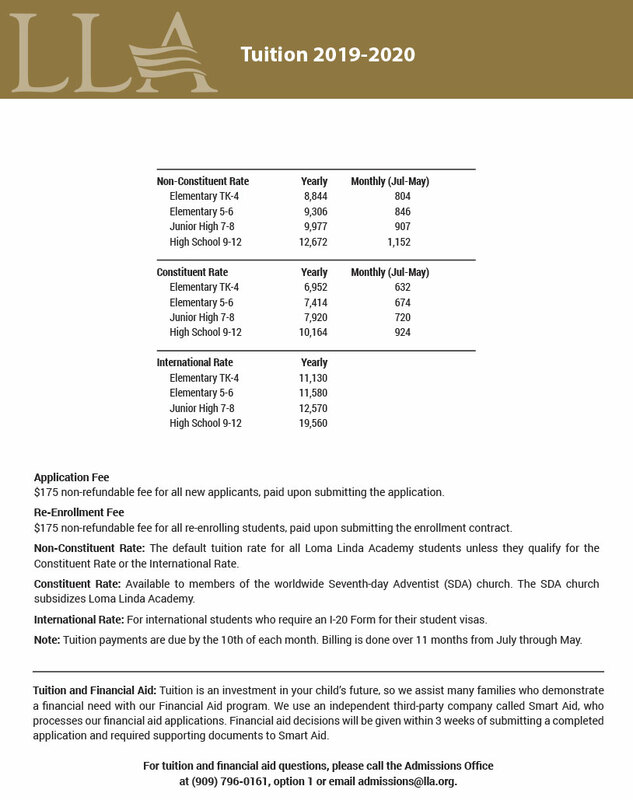 The Academy then reviews that information and makes a decision about financial aid. This process should be complete within 3-4 weeks of the time all documents have been submitted to Smart Aid. If you are ready to proceed, please click on the link below. If you have any questions about your application, please contact Smart Aid at the phone provided in your application. Thank you for choosing Loma Linda Academy. Financial Aid decisions will be given within 3 weeks of submitting a completed application and required supporting documents to Smart Aid.